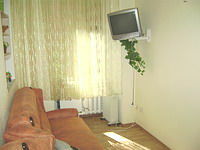 Apartments for daily rent in Odessa Ukraine. ID-105 One room renovated apartment on Sobornaya Square opposite The Spaso-Preobrazhensky Cathedral. The most perfect location. Capacity up to 2 people. shower. Air Conditioner. Internet Access. Fully tiled bathroom with shower cabin. ID-115. De-Luxe one room apartment in the down town area. The modern bathroom is provided with Jacuzzi bath. Air Conditioner. The apartment has a large living area and fully equipped kitchen. The kitchen has a gas cooker, refrigerator and independent hot water heater. Odessa Lanzeron Beach. Capacity up to 4 people. Total area 75 sq.m. Fully tiled bathroom with Jacuzzi bathtub. Everything in the apartment is new and of a good quality. ID-111. One room central located apartment on Novoselskogo / Dvoryanskaya St. Capacity up to 2 people. Fully tiled bathroom with bathtube. The appartment is equipped with cable TV, cooker, microwave oven, refrigerator, electric kettle, autonomous hot water supply. ID-129. Studio apartment in the down town area. Preobrazenskaya / Uspenskaya Street. Capacity up to 3 people. Air conditioner, refrigerator, autonomous hot water supply, iron + ironing board, hair dryer, TV, DVD, CD player. Fully tiled bathroom with bath. ID-101. One room apartment on Tiraspolskaya Square / Yevreyskaya Street (Central located, 10 min. on foot from Deribasovskaya Street). The apartment accommodates 4 guests (maximum). Air Conditioner. Fully tiled bathroom with shower cabin.